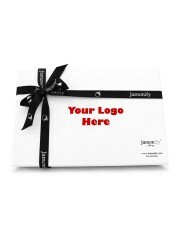 An exclusive gourmet hamper gift of Jamonify and Bodegas Sers. Includes a bottle of Sers Singular DO Somontano, limited production, and 4 envelopes of pure hand-carved Iberico bellota ham from pigs reared in freedom and fed on acorns. A taste of luxury with two exclusive and unique products 4 x 80 gr. 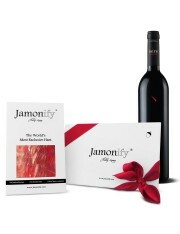 The most coveted gift hamper for perpetual lovers of Iberico ham Delicious slices of 100% natural Iberian acorn fed ham. Freshly hand carved with a unique aroma and flavor that will captivate you from the first slice. 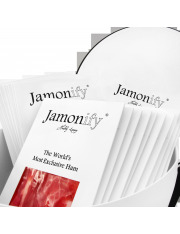 20 boxes of pure bellota ham presented in an exclusive luxury lined and handmade hatbox. Cross the border of the exquisite with the best ham in the world 20 x 80 gr.